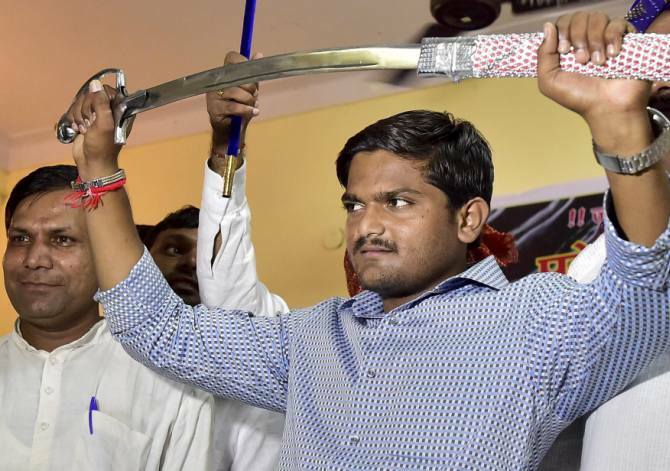 IMAGE: Hardik Patel, the 22-year-old Patidar leader. 'This small kid is talking about violence. He is exhorting his supporters to start buying guns and arms licenses. This is not a good sign for Gujarat's future,' says Alpesh Thakor. 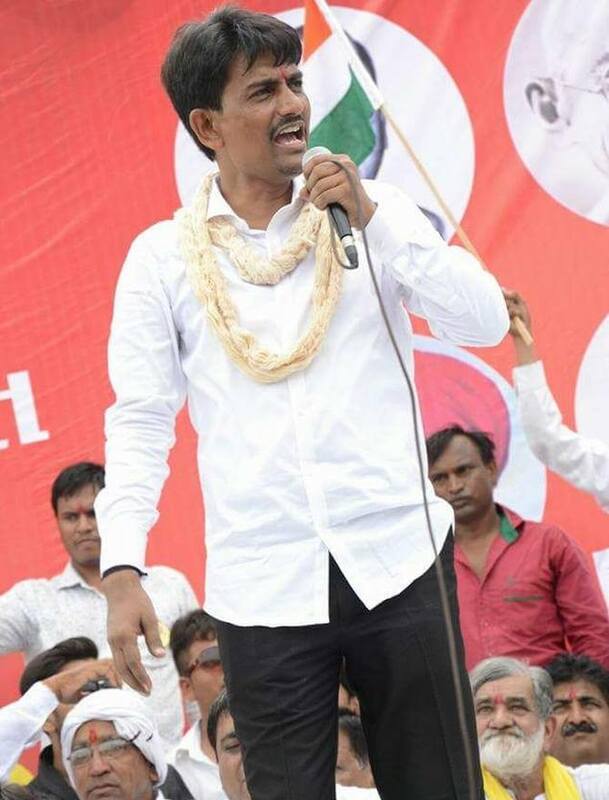 Alpesh Thakor, president of the Gujarat Kshatriya-Thakor Sena, that is organising Other Backward Classes, Scheduled Castes and Scheduled Tribes under a common umbrella against the Patidar agitation, has emerged as the antipode to the Patidar Anamat Andolan Samiti's Hardik Patel, who is currently leading a mass agitation for the inclusion of the Patidar community in the OBC category in Gujarat. Thakor spoke extensively with Prasanna D Zore/Rediff.com about why the Gujarat government should not allow Hardik Patel's reverse Dandi march and how Hardik is conspiring to get reservations for OBCs quashed. Will you go ahead with your Dandi march from the Sabarmati Ashram to Dandi (On March 12, 1930 Mahatma Gandhi had taken the same route to break the Salt Law, a tax imposed by the British on producers of salt and has a huge significance in India's independence movement) if Hardik Patel starts his reverse Dandi (this has now been renamed as 'Ekta Yatra' after a meeting between Hardik Patel's PAAS and Gujarat government led by chief minister Anandiben Patel on September 14; Ekta Yatra will begin from Dandi on September 19 now) to Sabarmati Ashram? We have been agitating against the PAAS (Patidar Anamat Andolan Samiti) for the last two months peacefully, but when Hardik (Patel) talks about ulti (reverse) Dandi we have told the government that he is trying to vitiate peace in Gujarat. We have asked the state government to deal sternly with him (Hardik, and his call for a reverse Dandi march). If the government permits ulti Dandi then we will oppose that with our 'straight' Dandi march. If he does that, our people will begin a Dandi march from Ahmedabad (the Sabarmati Ashram). Chiefs of 70 villages en route will join it and our plan of action is ready. But if he talks like this (threatens or blackmails the government) then our Dandi will also begin from here. If he is adamant on vitiating the peace in Gujarat, then we will not let him spoil the peace and harmony in the state with such marches. The government too should deal with him with an iron hand. If we start our Dandi, then he (Hardik) will not be able to take out his ulti Dandi. On the one hand you don't want Hardik to stage his reverse Dandi and spoil the peace in the state, but won't you add to that climate of disharmony if you stage your Dandi march to oppose what Hardik is doing? The way he has been carrying on with his agitation for the last two months and vitiating the peace here... we have always talked about Gandhian way of agitating peacefully... he was supposed to start his march on September 13, but on the 12th we appealed for peace at a meeting at the Gandhi Ashram. We just want to tell this government that the way Hardik is running this agitation in which about ten people have already died, property worth several crores (of rupees) has been destroyed and the government is unable to control him then shall we just sit without opposing such brute show of strength. But Hardik is not opposing reservations or job quotas for OBCs. He is just asking for inclusion of Patidars in the OBC category. We have appealed to Hardik on several occasions to go to the government or Backward Commissions (the National Commission for Backward Classes) if he wants Patidars to be recognised as OBCs. But let me alert everybody that he is using the 1985 formula. Back then they (the Patel community) had opposed reservations based on caste for OBCs and now they want to be included in the same category. This clearly tells us what their intention is. They don't want reservations; they want reservations to be cancelled altogether. He knows very well that the Patidars won't be able to satisfy the 22 norms needed to be eligible for reservations as OBCs and they will never be able to get the Patidars recognised as OBCs. Let me bring it to your notice that the Patidars had applied for the same in 1992 after which a survey was done the result of which came out in 1998 which stated that the Patidar community was Gujarat's strongest community educationally, socially and economically. This agitation is the latest formula to get our reservations cancelled. Hardik wants the right to reservation to be taken away from those who are Constitutionally entitled to it. Now, after two months of violent agitation, he is under pressure and so he has accepted to talk to the government. Dekho who abhi natak karega; kuch na kuch nautanki karega woh (Hardik will now throw tantrums and act in a way that ultimately these talks with the government will either be disrupted or rendered fruitless). He is just a 22 year old who has no knowledge of India's laws or Constitution. How will such a man handle a discussion on reservations in an intelligent, lawful manner? Ek dum bachkani baatein kar raha hai (His talks of getting reservations by any means are nothing but churlish). Reservations are not chocolates he can pick up from the streets. We have been appealing him to follow India's Constitution and based upon the provisions made for reservations fight for it. If the Constitution allows for reservations to Patidars we will wholeheartedly welcome it. 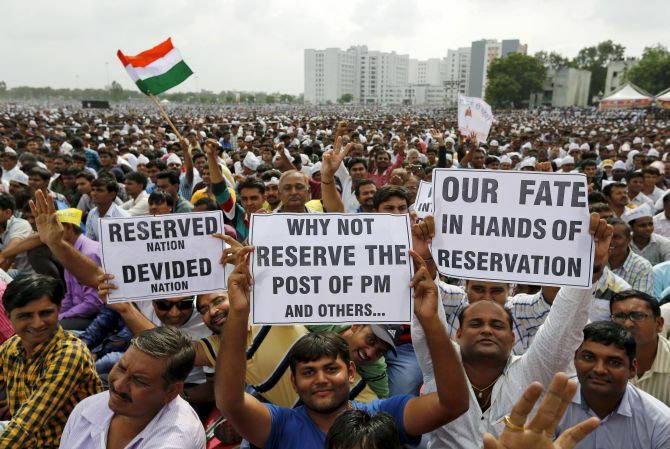 If you don't fit as an OBC as per our Constitution, then what reservation are you demanding? Hardik has been saying this on record, that he has no objection to OBC quotas in government jobs and educational institutions. He is just asking for the right to avail the same benefits. He does not want to take away reservations from those who already have it. You may not have heard the statement he made the day before yesterday (September 12) where he has pleaded his Patidar supporters to get license for guns. Why do they want these guns? Why do you want to own guns? Hardik is like my brother. His village is just 10 km from my own village. He was with me once. I have always treated him like my brother. I have always maintained that all Patidars in Gujarat are our brothers. But today the way he is speaking so aggressively against the OBCs as if they have snatched something precious from them. On one hand you call us brother and on the hand you hit us with sticks. What kind of brotherhood is this? If he thinks that we OBCs are his brothers then, shouldn't he understand that OBCs are not as developed (as Patidars); OBCs are still backward financially, educationally and socially. If he considers us brothers, then he should give up his demand for reservations. 90 per cent of Patidars in Gujarat are upwardly mobile, own businesses; all self-financing colleges are owned by them. Most private sector businesses belong to them. 44 per cent of all government jobs are with them (as part of the open category) despite them being just 12 per cent of Gujarat's total population. According to the Gujarat caste census of 2013-2014 survey, 11.5 per cent of Gujarat's population is Patidar. But is the caste census for 2013-2014 published? Where can one get these figures on the Web site of Gujarat government? And these figures were never challenged by them. I have been saying this for the last two months (Hardik Patel's agitation for reservations is also almost two months old ). They are now saying our representation in government schools, colleges and jobs is less. OBCs just constitute 15 per cent of government jobs even as our population is 54 per cent. And the general category population is 22 per cent (including the Patidars) and they make up for 52 per cent of all government jobs. IMAGE: A scene from the August 25 Patidar rally in Ahmedabad. 'When Hardik speaks about only eight Patidars (who died in the violence that followed the August 25 meeting at Ahmedabad's GMDC ground) when two people including a Thakor and an Adivasi too died, it gives you a peek into his mentality and attitude towards non-Patidars. We talk about ten people, but he talks only about Patidars,' says Alpesh Thakor. To maintain this status quo, Hardik has launched this agitation. The Patidars don't want this equation to change and that is why he has launched this agitation, the ultimate goal of which is to get reservation quotas quashed for OBCs too. This is just a new way of launching an anti-reservation agitation. The only good thing that has happened ever since this Patidar agitation began is the consolidation of OBCs, STs and SCs. This agitation unified us and created an awakening among all the backwards about their rights. And now we fight together for our Constitutional rights. While you are suggesting that Hardik Patel is blackmailing the Gujarat government with his show of strength, aren't you also blackmailing the same government by announcing a counter agitation from Sabarmati to Dandi? I have already said that if this government allows ulti Dandi, only then will we start our straight Dandi march. We want to tell them that when Mahatma Gandhi began his historic Dandi March it helped unify the country. By following the same route as Gandhiji's we too want to unite all sections of Gujarat. Hardik, by launching an ulti Dandi will only stigmatise the historic significance of Gandhiji's Dandi March. But if you try to sully Gandhiji's principles of peace and non-violence we are going to oppose it. What is most surprising here is while you and Hardik talk about Gandhiji's principles of non-violence wouldn't your straight Dandi in response to Hardik's reverse Dandi create tensions among various sections of Gujarat? Will it not lead to violence? That is the government's problem. There is a distance of 300 km between these two Dandi marches. If the government stops them at Dandi (from where Hardik has announced his march), then where is the question of there being any tensions? I had advised Hardik and his supporters to launch a Dandi march just like Gandhiji's. Start from Gandhi (Sabarmati) Ashram and end your march at Dandi. Why do you want to take the reverse route? They are doing that to take India back to the age when we were the slaves of the British. That is their conspiracy. While Hardik indulged in violence we have never spoken or acted in a violent way. He talks about Bhagat Singh, but did Bhagat Singh divide Indians? Was that his ideology? Did Sardar Patel or Bhagat Singh ever usurp the rights of the downtrodden? They fought for the rights of the backwards. Our formula is not to disturb peace in the state. We are just appealing to the state government to deal with this agitation with an iron hand. As of now, there is peace is Gujarat; we are all living like brothers. But those trying to show their numerical strength on the streets will only spoil this peaceful atmosphere. What are you trying to prove with your straight Dandi? What will you achieve with that if not tension among fellow citizens and violence? There will be no tension. Ours will be a peaceful agitation. Will you take responsibility if there is violence in the state because of your counter agitation from Gandhi Ashram to Dandi? I have already appealed for peace the other day when I offered my prayers at the Gandhi Ashram with my supporters. I would have taken them to Dandi from there, but I don't want to spoil the peace in the state. We don't want to act in any way that will be against this country's democratic and Constitutional principles. We don't want to disturb the law and order in the state. We all respect the rule of law and appeal for the same to the Patidars and their leaders. In the end we will have to sit across the table and sort out these issues. Patidars are our neighbours in my village. I have appealed to all senior Patidar leaders to stop this child who has gone astray. This small kid is talking about violence. He is exhorting his supporters to start buying guns and arms licenses. And he is saying so openly at public gatherings and with the media. This is not a good sign for Gujarat's future. If he speaks this language, then he is encouraging violence. When Hardik speaks about only eight Patidars (who died in the violence that followed the August 25 meeting at Ahmedabad's GMDC ground) when two people including a Thakor and an Adivasi too died, it gives you a peek into his mentality and attitude towards non-Patidars. We talk about ten people, but he talks only about Patidars. He didn't express his condolences for the death of a Thakor and an Adivasi. These two didn't die in police firing. The agitators (the Patidars) killed them. If you remember history well, then Gandhiji withdrew the non-cooperation movement in 1921 after a mob burnt 21 policemen alive at a police station in Uttar Pradesh's (then United Province) Chauri Chaura. Gandhi took the moral responsibility for the deaths of these policemen. Would you, in a similar way, take the moral responsibility if there is a clash or violence between your supporters and Hardik's supporters during your two Dandi marches? Definitely (I will take moral responsibility). I don't want any kind of violence in Gujarat. I will only pray to God to make them wiser. On August 23 (two days before Hardik's GMDC agitation) I had got almost 200,000 people at Gandhi Ashram to create an atmosphere of peace and brotherhood. And that is why Gujarat stayed calm and peaceful even after incitement by Hardik and his followers on August 25. I was with my supporters in Ahmedabad the whole day on August 23. August 25 was Hardik's agitation. There was no friction or tension during my rally. All my supporters returned to their homes in a peaceful manner. I had appealed to them that whatever happens on August 25, you should not come out of your homes, accept their abuses and not come out in the streets to express your anger. But today if Hardik goes ahead with his reverse Dandi you will take out a counter agitation. There is no question of confronting anybody. We will maintain peace in the state at any cost; a small child, who is one of us, has lost his way. But to make him feel responsible and understand the feelings of others we will have to do something. Our counter agitation will be only to make him wise and maintain social harmony. And you think that Hardik will see sense the way you want if you too start your straight Dandi march. Shayad mil jaye (I only hope he gets wiser). But if he doesn't become wiser than the government should not give him permission. But if the government gives him the permission, then the state government's intentions too will become clear that they want disturbance in the state and in cahoots with Hardik. Isn't it also your responsibility that you should also do your bit to maintain peace and harmony, law and order in the state? Bhaiyya, I have already told you that it is our responsibility too. We are not running away from our responsibility. But is that responsibility only ours? Since the last two months we have kept quiet despite provocations from them. Isn't it their responsibility too? It is everybody's responsibility. I am saying that I will take moral responsibility (if there is violence), but that will never happen. I have already made appeals for peace and told my supporters that we may fight once or twice but ultimately we all will have to come together. This is their fight against the government and let them continue with it. I have full faith in the people of Gujarat that they will not do anything that will lead to feelings of hatred against each other. Would you like to pass on any message to Hardik or issue an appeal to him? My only appeal to them is to maintain peace and law and order in Gujarat. We are brothers and will remain so. In the coming days we will have to come together for the progress and development of Gujarat. If you want reservations for Patidars, then follow Constitutional procedures. Do not accept the path of violence to fight for your demands. Trouble ahead for Amit Shah?